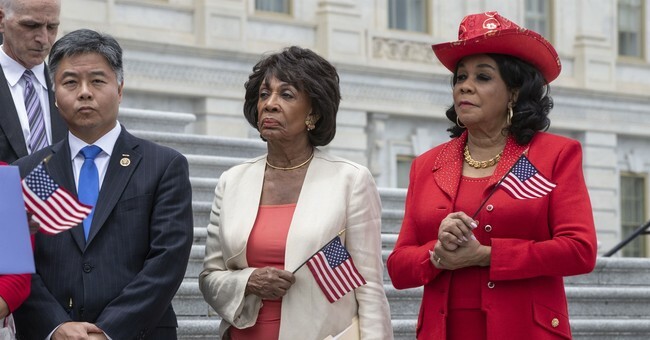 This week, Rep. Maxine Waters, D-Calif., issued a clarion call to Democrats outraged at the policies of the Trump administration: It's time for mob action. In the wake of mobs targeting Secretary of Homeland Security Kirstjen Nielsen and Florida Attorney General Pam Bondi, Waters explained: "God is on our side! On the side of the children ... Let's make sure we show up wherever we have to show up. And if you see anybody from that Cabinet in a restaurant, in a department store, at a gasoline station, you get out and you create a crowd and you push back on them and you tell them they're not welcome anymore, anywhere." Waters has always been a fan of mob action. She infamously touted the violent and brutal 1992 Los Angeles riots, which did approximately $1 billion in property damage and ended with 63 people dead. Waters called the events a "rebellion," labeling them a "spontaneous reaction to a lot of injustice and a lot of alienation and frustration." And yet Waters has been affectionately nicknamed "Auntie Maxine" thanks to her rabid attacks against the Trump administration. Democratic leaders ranging from House Minority Leader Nancy Pelosi, D-Calif., to Senate Minority Leader Chuck Schumer, D-N.Y., denounced Waters' words. They've done the same with regard to violent protests on college campuses. That is meritorious and deserves praise. But there is little question that major political figures on both sides of the aisle have played footsie with mob action to little or no blowback. It's not just Waters. President Obama made excuses for riots in Ferguson, Missouri, and Baltimore, Maryland, during his presidency; Rev. Al Sharpton, who has actually been involved in precipitating mob violence, still gets to play peacemaker on national television; during President Trump's 2016 campaign, he repeatedly referenced the possibility of violence against protesters. No civil society can humor such overtures to mob action and remain civil for long. The First Amendment protects Maxine Waters, of course, and it should. But Americans should be appalled by her words, rather than slightly titillated by them. And yet it seems that extreme rhetoric now earns a sort of badge of "coolness" that can't be matched by those calling for cooler heads. To call for civility now seems unwoke. No wonder Symone Sanders of CNN stated, "the folks calling for civility might need to check their privilege." To be angry is to be justified; not being angry enough is the greatest sin. And that is dangerous. It's not that Americans will suddenly begin attacking one another in the streets. It's that large populations can be moved by small, extreme minorities. Nassim Nicholas Taleb writes in his new book, "Skin in the Game," about the phenomenon of "renormalization," whereby larger, more moderate groups appease small minorities simply to avoid certain costs. That can happen when reasonable people stop standing up to advocates for mobocracy, afraid that doing so will alienate their most vocal supporters. Waters has always been a fringe figure. Perhaps she'll remain so. But there are no guarantees. And we shouldn't be sanguine about the prospects of quashing radical tribalism. It's not quite as easy as putting out a few tepid statements.